Several days ago, I was driving in that area, and made a wrong turn. I turned around in the parking lot behind the BC/BS building. It looked to me at the time like they had vacated the building, but BC/BS still has their old signs up. It would be interesting to know what plans they have for the building (or perhaps I am in error). Quite a substantial post here, with lots of history. Thank you. Gary, yet another impressive, detailed post. Thank you for boiling down the contents of several sources into a very readable, engaging format. Learning about the early leaders of Durham always leaves me thankful for their sense of noblese oblige. Warren Buffet and Bill Gates notwithstanding, it seems like our current crop of uber-rich (from Paris Hilton to the deceased Ken Lay) fail to grasp it. Taxes, schmaxes, where's the party? Brodie, chided by his brothers as the "Real Estate King of Durham" for his role in developing the trolley car communities to the west and north of downtown, felt that Watts was usurping his role in the family business. (Brodie's heavy drinking didn't help matters much, either.) Upset, Brodie delivered the development plans for the Old North Durham neighborhood to City Hall. On it, he had designed and named four roads to run north-south. From east to west, Brodie laid out streets named "Washington", "Duke", "Hates", and "Watts". Hates Street was replaced with the more pious "Gregson", the surname of the Duke's family minister. Harwood Hall lives on within the walls of the Villa Teo (Whitehall at the Villa Antique Shop) in Chapel Hill. 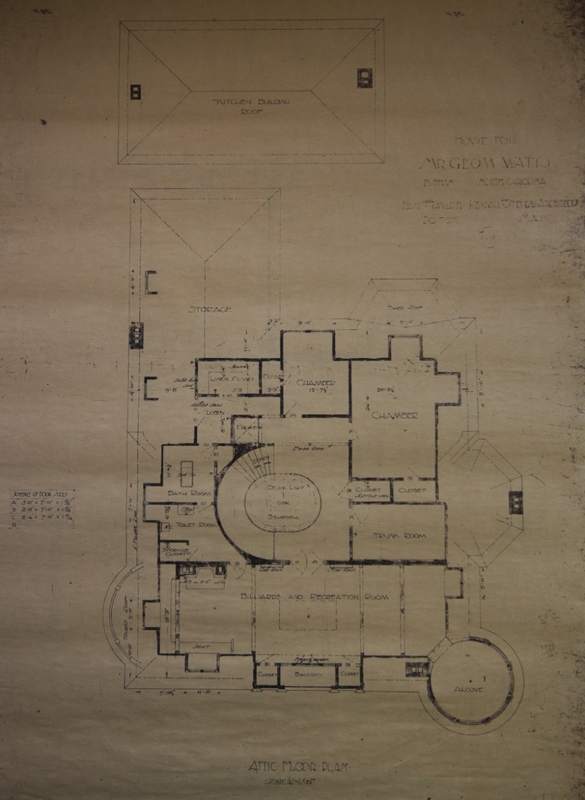 The main stairs, the music room, and other elements of the home were removed and used during the Villa's construction. It's my understanding too that elements from Four Acres were used there as well. I'm told that the stucco wall on the rear of the BCBS property is all that remains of Harwood Hall on site. The story mentioned above (street naming) is also referenced in Jean Anderson's book "Durham County", although it always seemed a little far-fetched to me. If my sources are sure, the BSBCNC building will become the new location of the Duke PA school. Also...andrew wrote that "From east to west, Brodie laid out streets named 'Washington', 'Duke', 'Hates', and 'Watts'." As anon noted, this seems far-fetched especially since we generally read, essentially, west to east (left to right), no? So, were I consulting a map of the time, I'd read Watts Hates Duke Washington which would be odd indeed. Perhaps, had an Interstate been invented then and the one named 85 were there, Baltimoreans traveling south might've read the exits that way...but that's quite a stretch (and, at best, looks like we would've gotten Duke Hates as exit messages). Where did you get the floorplans from? The title of Howard Covington's book about the Watts and Hills of Durham- "Favored by Fortune" - seems somewhat trite at first glance, but it is an apt description of George Watts' entry into the gentry of Durham. When your father buys you a 1/5 share in the Duke and Sons Tobacco company, you are certainly starting with a leg up in the world. Watts came to Durham from Baltimore in 1878; after finishing at UVA, he went to work for his father, Gerard Watts, a Baltimore tobacco wholesaler. Gerard Watts, although he had sold the pre-eminent Durham brand of tobacco - Blackwell's Bull Durham, saw the uprising of Duke and Sons - as well as their need for capital to expand - as an opportunity to invest. That $14,000 bought a 1/5 share of the company, and his son was on his way to Durham as an equal partner with Washington, Ben, Buck, and Brodie Duke. Watts spent much of his first year on the road, including time in the Chicago office, but formed a collaborative friendship with another recent arrival to Durham - Eugene Morehead. 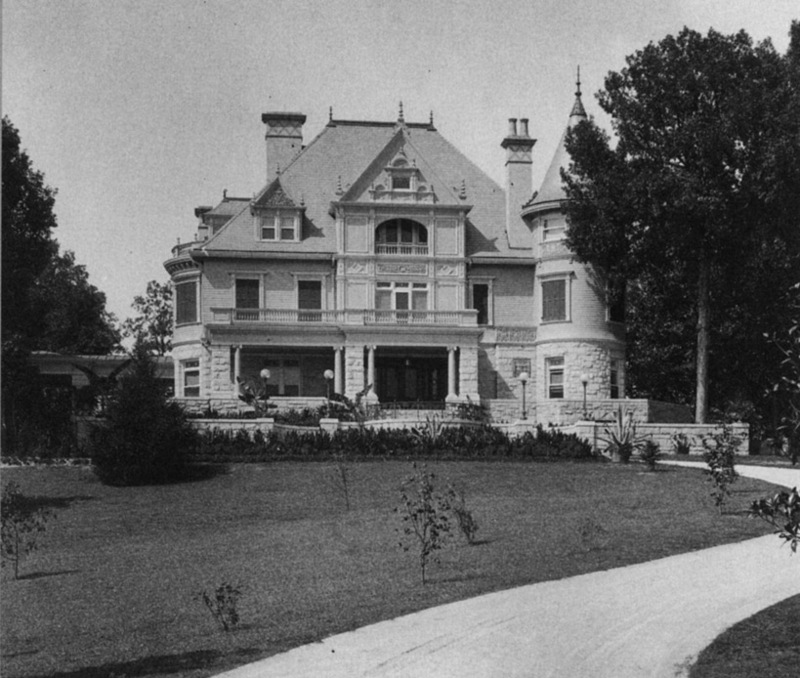 Morehead had grown up in Greensboro - in the Blandwood mansion of his father, former North Carolina Governor John Motley Morehead. Morehead and Julian Carr had been classmates at UNC, and Carr had been instrumental in persuading Morehead to come to Durham, where he was an agent of the Department of Internal Revenue, and began Durham's first bank -the Morehead Bank. Both built strikingly similar Queen Anne Victorian houses side-by-side (perhaps Morehead chose one style with different embellishments?) between present-day Morehead Ave., South Duke, and Proctor St., completed in 1880. 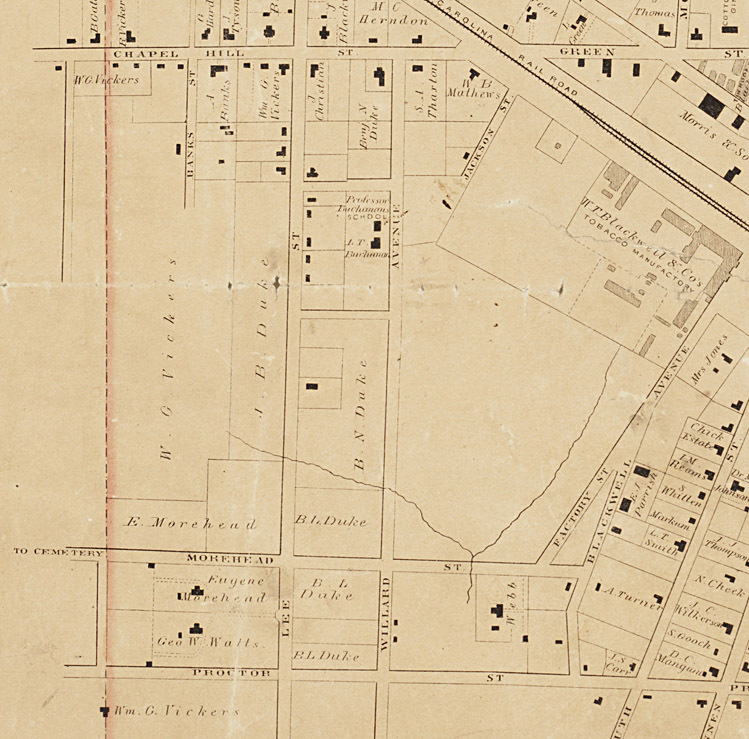 Detail from Gray's 1881 map of Durham, showing development along West Chapel Hill St., the branch of Third Fork Creek that drained the low areas southwest of downtown, and Morehead and Watts' houses. Lee St. (sometimes Lea St.) was the earlier name for Duke St. [Interesting to note that the 'river' at American Tobacco isn't entirely without historic precedent.] The map also shows the land ownership - much of the undeveloped land in this area belonged to the three Duke brothers and Vickers. George Watts' original house, looking west from Duke St., 1895. 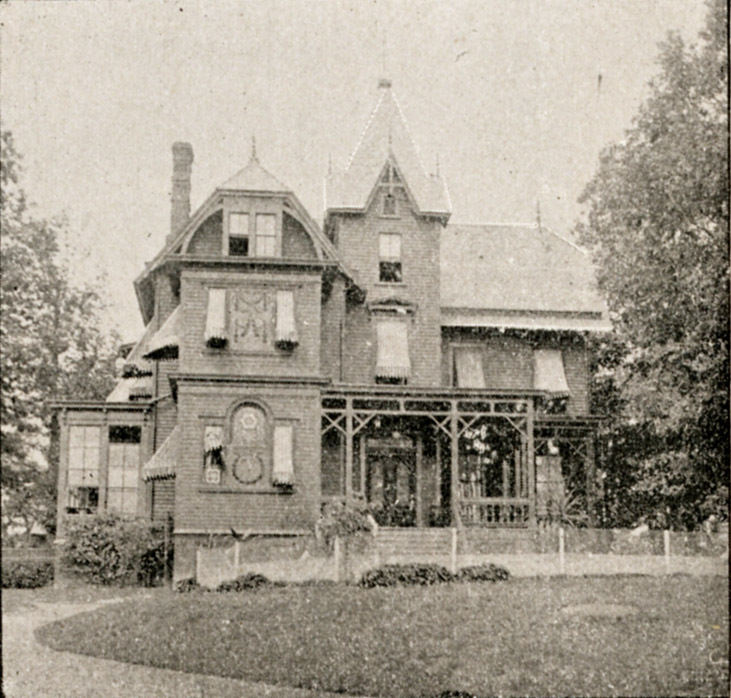 Watts established full-time residence in Durham with his wife and daughter, Annie Louise, who joined him in 1880 having stayed in Baltimore until the house was complete. Watts' star was rising along with the fortune of Duke and Sons. He became involved in several additional ventures early on, including the Durham Electric Lighting Company, the Durham Literary Society, and the Durham Lyceum. He was a partner in the Durham Fertilizer Company with his brother in law Louis A. Carr, who had also come to Durham from Baltimore. He was an investor in Erwin Mills, along with the Dukes. He helped form the Interstate Telephone and Telegraph Company along with Julian Carr and Louis Carr. However, Watts is most remembered for building Durham's first hospital - which would be named Watts Hospital, on the corner of Guess Road (now Buchanan Blvd.) and West Main St. The push had come for years from Dr. Albert G. Carr, Julian's brother and Durham's first physician. By the 1890s, the American Tobacco Company ("the Tobacco Trust") had begun to dominate American cigarette manufacture, and the partners in the company became even wealthier. In, 1895-96, Watts moved his original house across South Duke St. to make way for Harwood Hall, a three-story chateau of pink granite. George Watts and his wife lived in Harwood Hall through the early decades of the 20th century. Watts remained intimately involved in the multiple businesses in which he partnered with the Dukes, as well as First Presbyterian Church. For further reading about the Dukes and Watts business, I highly recommend "The Dukes of Durham" by Robert Durden. In 1921, George W. Watts became ill and died - thousands of peeople evidently left work early to come to the service at Harwood Hall, where they stood on the front lawn in the rain to listen. Watts' widow (he had remarried after the earlier death of his first wife) remained on at Harwood Hall, and the estate was passed to his daughter Annie and her husband John Sprunt Hill. Annie and John's son (and George Watts' grandson) George Watts Hill had helped his father design the Carolina Inn in Chapel Hill while he was an undergraduate and law student. Soon after graduating, he married Ann McCulloch; after an 18 month honeymoon, they moved into Harwood Hall, which had been vacated by GW Watts' widow when she remarried in the interim. Despite this, the couple moved into the house from 1926 until 1938. During that time, Watts Hill participated in his father's (John Sprunt Hill) banking business and a host of other community roles. He was quite involved in the management of Watts Hospital. In 1929, he embarked with Dr. Wilburt Davison, dean of the new Duke Medical School, on a plan to provide a "low cost hospital care plan for workers in the manufacturing plants." Health insurance was essentially unknown until the early 20th century, but employer-provided plans to cover the rising expense of hospital care had been implemented in nearby Roanoke Rapids. Much of the medical establishment in Durham endorsed the plan, and the Durham Hospital Association was announced in March, 1929. However, there was widespread resistance to the plan when it was announced, and the Depression helped seal its fate. However, the plan was revived in 1933 when a Raleigh insurer came to Hill to ask if Watts Hospital was interested in joining a new insurance plan, called the Hospital Care Association. The HCA succeeded where the DHA had not, slowly building subscriptions - at first mostly Morning Herald employees and Duke employees, but growing steadily. By the late 1930s, it had 62,000 members and was "qualified to carry the Blue Cross emblem." 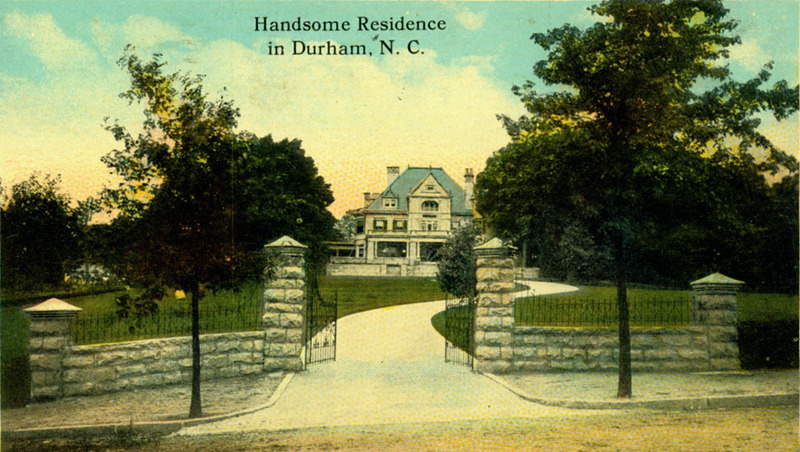 Also during this time, GW Hill had acquired the old Quail Roost hunting club on Roxboro Road in northern Durham county and converted it into his own 'gentleman's (dairy) farm.' The couple prepared to move to Quail Roost full time in the late 1930s, not least because of Ann Hill's dislike of what Harwood Hall represented. When George Watts Hill left Durham during World War II, the couple had moved from the house. Watts Hospital, which always had had a nursing school, used it as a temporary home for nurses, but it was far from the campus - which was by then at Club Blvd. and Broad St.
After returning from WWII, GW Hill tried to find an alternative future for the house; in 1949 he tried to engage a hotel management company to Durham to turn it into a stylish (what we'd likely call 'boutique' now) hotel, after he'd encountered a similar house-converted-to-hotel on vacation at St. Simons Island, Georgia. He suggested that the large first floor rooms could be dining and living space, and the second floor could be used for "high priced accomodations" (Covington, p. 245.) Hill suggested that the company could build another 20 to 50 rooms in a modern annex behind the main house. He even offered to raise local investment and provide construction loans through his bank, Durham Bank and Trust. However, the deal went nowhere, and Hill "turned the building over" to Allied Arts of Durham in 1954. I'm unsure whether Hill retained ownership of the house during that time. A multitude of visual and performing arts groups had come into being during the post-war era, each individually supporting their own particular medium. The president of the Theatre Guild called a meeting with the principals of the other groups (including The Art Guild, Civic Choral Society, Duke University Arts Council, Chamber Arts Society, and the Durham chapter of the North Carolina Symphony Society) to discuss forming an umbrella organization to provide mutual support in 1953. Their assent was the genesis of United Arts, which became Allied Arts of Durham in 1954. They moved into Harwood Hall in October, 1954. Allied Arts of Durham is now known as the Durham Arts Council. Work on the driveway and house prior to occupation by Allied Arts, 8.31.54. Allied Arts used the building for performance and meetings until late 1960, when they moved to the Foushee House ("The Terraces") two blocks away. It isn't documented how or why these events transpired, but Harwood Hall and the old Morehead House next door were demolished in January 1961 for the Hospital Care Association Building. I assume that Hill's association with HCA was the impetus for this, and that he likely retained ownership of the house. Aerial of the block, 1959. One Herald-Sun story notes that "artist Gerard Tempest" purchased the Watts house for $5000. I assume this means that he purchased the house materials for $5000. He dismantled the staircase and some other materials and used them to build a arts space on Franklin St. in Chapel Hill, which later became a restaurant called Villa Teo, and is now part of Whitehall at the Villa. (Tempest also used materials from Four Acres and the Morehead House to construct the villa. He also turned the old Fire Station #1 into the 'Tempest Building'. A large Georgian Revival building was constructed on the site of the two former houses. In 1968, the Hospital Care Association merged with with the Hospital Saving Association of Chapel Hill to become Blue Cross Blue Shield of North Carolina, which still uses the building today. Looking west-northwest at the Blue Cross Blue Shield building, January 2008. The gap between the oak trees was the driveway entrance to Harwood Hall.